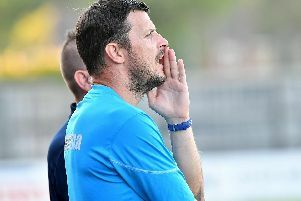 More of the same is the order from Craig McAllister as the Gosport Borough boss called on his team to give their all in every Southern League premier division south match. A shock 3-1 win at Weymouth last time out has given everyone a welcome lift. McAllister saw in that success exactly the type of attitude he wants from his players for every match. Borough head for Kings Langley on Saturday looking to complete a rare league double. 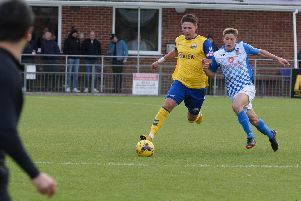 They beat their hosts 3-2 at Privett Park earlier in the season. The Borough player manager said: ‘It is another tough away game for us and it is all about getting the mental approach right. ‘I am sure a big factor in our win at Weymouth was attitude. ‘The players knew they were up against a top side and pulled out all the stops. ‘We have to get into the mindset that every game is a big one. ‘If we can replicate the same approach we had at Weymouth then we will give ourselves every chance. The visitors are boosted by having Sam Roberts and Ryan Case back in contention after injury. McAllister is a firm believer that competition for places breeds success and he has been impressed with the impact two recent arrivals have had on his squad. He added: ‘Matthew Weaire, from Brighton, and George Bennett, from Basingstoke, are two young players with terrific potential. ‘They have both been fantastic for us. ‘Their standards are high and they both want to be winners. McAllister believes his team are going to get stronger as the season goes on and has challenged his players to go on a winning run. He added: ‘We need to string four or five wins together. ‘If we want to do anything then it is no good winning one, losing one and then winning one. ‘To reach the play-offs a team has to put together three or four good runs during a season. ‘We haven't done that yet.